Michael Dean, Laughing for crying, 2019, mixed media, dimensions variable. “FECKSAKE” stammers across the hazard tape wrapping the gatepost of St Carthage Hall; tatters of the yellow material flap from the gate itself. The minced oath is a localized version of its angrier Anglo brother, “FUCKSAKE,” which appears inside. It’s a colloquial softening of implicit rage; in Ireland, they can tell you to “feck off” without causing offense. This balance between gentle persuasion (or exasperation) and cold fury is the axis on which Michael Dean’s site-specific installation turns. 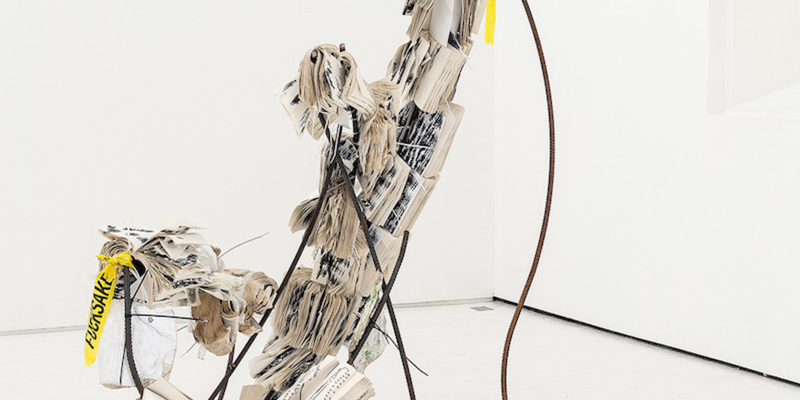 A lone sculpture made from twisted rebar and cloaked in the pages of splayed paperbacks, Laughing for crying, 2019, resembles what the artist described in a pre-opening talk as a “fucked dove.” Here, the bird of peace has been turned upside down, its flying days clearly over. Dean has placed a pile of slender books at its “beak.” They are bound and printed in branch-of-peace olive green. Titled Love Dancing on Hate’s Grave, the text is in three parts. The first recounts how Hate abuses Love: punching, hitting, isolating, threatening, cutting, devouring. In part two, the word Love is replaced with Hate, and Sadness with Love. Finally, Love metes out a similar treatment to Hate: the same violence, different ends. Meanwhile, the texts sheathing the sculpture form a dictionary of nasal, nonverbal utterances: grunts, mumbles, whines. This imagined primal lexicon recurs throughout Dean’s practice. Language is an overlay on that intrinsic human drive for expression, relation, and understanding. It distorts and can impoverish feeling. Some of the pages are patterned with black AK-47s that spell out pollen: The seeds of love and hate are planted early and grow vigorously. As this deceptively simple installation demonstrates, they may also be closer cousins than we want to admit, their violent corollaries equally, frustratingly inevitable.